This week I’m focusing my efforts on another cocktail that was nearly lost to the annals of time, the 20th Century Cocktail. Invented in 1939 by C.A. Tuck and first published in the Cafe Royal Bar Book published in the same year. But don’t be confused, this cocktail wasn’t named after the century itself but rather the Twentieth Century Limited, a train that ran from Chicago to New York. The train had a number of notable features that put it head and shoulders above it’s competitors of the day. First, it could make the trip from NYC to Chicago in only 16 hours. 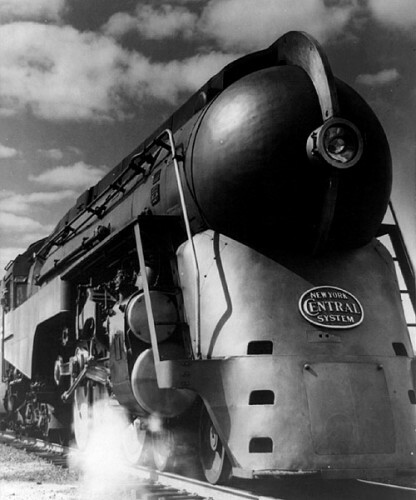 Second, it offered a barbershop and secretarial service and guests boarded and disembarked via a plush red carpet, hence the term “the red capet treatment.” Third, the train was put in to service in the early 1900’s but received a fresh new look in 1938 when it was given a streamlined Art Deco look. This change in look and the associated ad campaign are certainly what inspired this cocktail. The drink was rediscovered by Ted “Dr. Cocktail” Haigh and I’ll be starting my exploration with the recipe found in his book Vintage Cocktails and Spirits. I’ve added a new page to the Cocktail Hacker site, namely my Liquor Cabinet. It’s bit rough right now but my plan is this. I’m going to update this page on a quarterly basis with what’s in the “cabinet” including an updated picture. At some point I’d also like to expand it, or make another page, to include my recommended ingredients to get you mixing. If there is anything amazing that I’m lacking, which I know there are, let me know. As you mix your first Singapore Sling you’ll note that the color is decidedly pink. There are some out there, myself included, who naturally shy away from all things pink. It’s a self protection mechanism of sorts. I ask of you only one favor at this time. When you get that first Singapore Sling fully mixed, turn off that anti-pink mechanism just long enough to take your first sip. After that it won’t matter any more. You’ll gleefully consume the rest of the drink, pink color be damned. 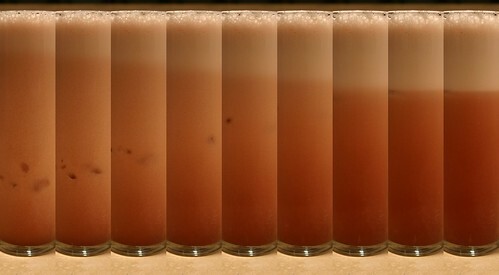 This drink is more complex than it would seem at first blush. I assumed that the flavor will be overly sweet and fruity from the pineapple and liqueurs. This is where the club soda is key. It lightens the sweetness of the drink and adds a small amount of effervescence. As you bring the drink up for that sip you’ll notice a gentle and entirely pleasant earthy aroma. This is from the Benedictine and to some degree the bitters. Now for the flavor. Tremendously refreshing. Some recipes call for lime or lemon juice while others, the Joy of Mixology recipe included, do not. I found that the citrus juice added a slight hint of sourness to the drink that was necessary to round out the flavors. Without it the drink was simply overly sweet for my palate. The bitters aren’t directly present as they are in some cocktails, the Manhattan for example, but they are there. Overall the flavor is well balanced and quite delicious. In looking at recipes I found a multitude of variations. There were two that stood out to me. One recipe didn’t call for pineapple juice at all. This changes the flavor profile of the drink entirely. I’d go so far as to say the resulting drink isn’t a Singapore Sling at that point, but rather something else, delicious or otherwise. The pineapple juice is absolutely essential. Another recipe I ran in to included all the usual ingredients in their usual amounts but left off the club soda. While the resulting drink was very good I don’t think you could call it a sling any longer. 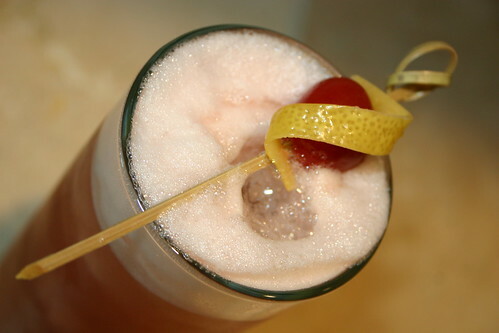 Slings are a class of sparkling sours, of which the Tom Collins is also a member. So, to leave off the club soda is to remove the cocktail from the sling category. Once all the proverbial dust had settled my favorite recipe is the one found in Vintage Cocktails and Spirits by Ted Haigh. This recipe includes both the citrus juice that I like and the club soda that’s essential. If you find yourself looking for a delicious summer drink look no further than the Singapore Sling. You could easily mix them up by the pitchure and add a splash of soda to each as you pour them. The Singapore Sling is a drink I would imagine nearly everyone has heard of, at least in passing. However, my guess is that most people haven’t ever had one. I know that I certainly fall in to both categories. I’ve heard the name, know the general recipe and even know a bit of the history, but I’ve never enjoyed one. Seems like a fitting time to change that. 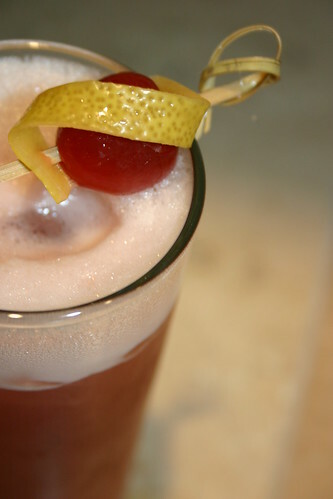 The Singapore Sling began life as the Straits Sling, an invention of Ngiam Tong Boon of the Long Bar at the Raffles Hotel in Singapore. The drink is said to have been created in 1915 but didn’t change names to the Singapore Sling until some time around the 1930’s. I can’t really give you any more juicy details than that without simply regurgitating what has already been said by those more in the know than myself. If you’re interested in an in-depth history of the cocktail take a look at this paper authored by Dr. Cocktail himself, Ted Haigh.